Users can use this method on how to Install iTunes for Android. We have shared three different methods for installing iTunes on Android. You can use iTunes and listen to all your favorite soundtrack on Android device. Users can even use iTunes without installing any external software. I have shared a tweak to add your iTunes to Google Play Music. If you are the iPhone user and uses Android as well then you might want to get the access to iTunes for Android. It is also possible that you might be looking for the ways by which you can get the access to iTunes for Android. In this section, I have shared some best ways for you so that you can get iTunes for Android. There are some methods listed in this part of the article which has the capability to help you in accessing iTunes for Android. Let us go through the below methods and explore each n every method one by one. Google Play Music will let us use the iTunes for Android. A user can use Google Play Music to upload the iTunes for Android. Google Play Music has the ability to store up to 5000 songs and also allows to add music from iTunes music store as well. Below I have mentioned the method with full step by step guide to know that how exactly you can take the help of Google Play Music to use iTunes for Android. Get the Google Play Music on your Android phone and PC. Now, log in to the Google account on both the device in Google Play Music app. Then, go to My library option in the app. Now, Add music and select iTunes option. Let the synchronize is done. Once it has done then you will see the iTunes music on your Android phone. When we connect an iPhone, iPod or any other iOs device with our computer then it shows the option to copy the iTunes music folder. So, we can take the help of this functionality to copy and paste the iTunes folder on our Android phone. Using this method we can easily get the access to iTunes for Android. Check out the method from below which I have explained in the simplest way. Now, open the Music library on your PC. After that, copy the Music folder. Lastly, paste it into Android phone’s memory. 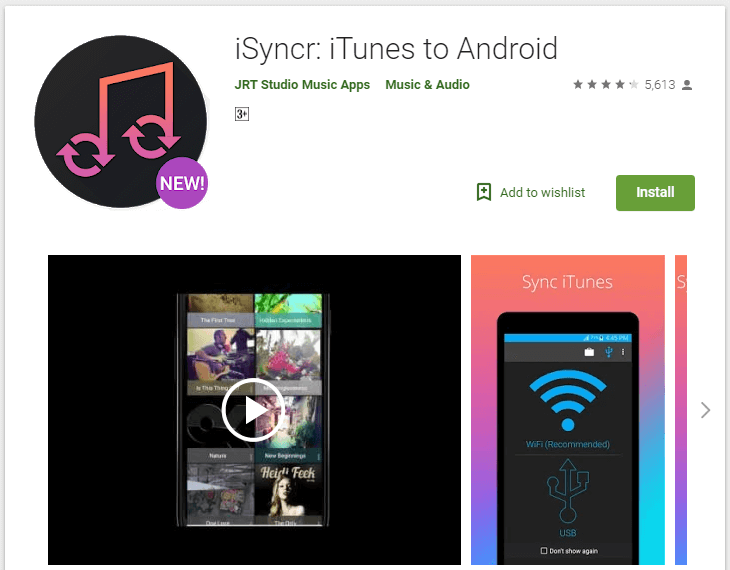 iSyncr is the Android app which is designed to get iTunes for Android. It is a very light weighted Android app and the user interface of this app is very simple. This Android app is available on Google Play Store so that you can get it directly from the Play Store app. But the thing is that how you have to use this app to get iTunes for Android? So, let us check the steps by which you will know how you have to operates this app. Get the iSyncr app from Google Play Store. Now, get the desktop version of this app on your PC. Then, connect your phone to your PC meanwhile, you have to open this app on both devices. A window will appear and ask you to transfer files to your device. Simply, click on iTunes button and then click on Sync button. Once the procedure is done then open the app and you will see your iTunes music in it. These are some extraordinary ways to get the access to iTunes for Android. I would like t tell you that if you want to get iTunes for Android then it is not possible because Apple has not created any Android app for the Android users. However, you can use these methods to access the iTunes for Android only. Moreover, iSyncr App can be work as the iTunes app for Android but, none of the other methods can let you install iTunes to Android. I hope you have now got the idea about iTunes for Android. Share this article with your friends and family members so that they can also get the access to iTunes for Android.